For your fingers...for your playing...for your AUDIENCE. 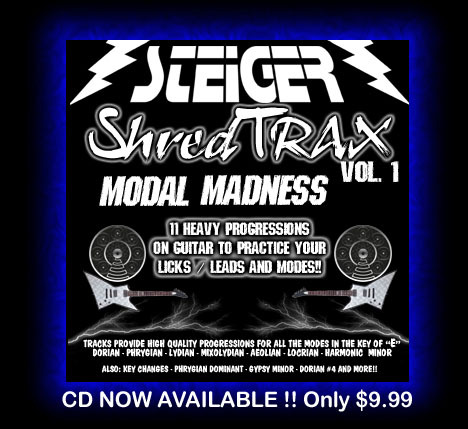 Hi, STEIGER here...I created the "ShredTRAX - Modal Madness" series to give players some heavy jam-along Backing Tracks , to practice their soloing, licks, exercises and arpeggios...but over something EXTREMELY HEAVY!! Also allowing them to explore different Modes and Exotic Scales over something that was NOT all light and pretty. I have been teaching at Musicians Institute in Hollywood for over 17 years now, and over the years I have written some really cool modal progressions, that I have finally had a chance to record properly. Mixed and Mastered to the highest quality. The rhythm guitar tones are just ripping..
"Just think Slayer meets Black Sabbath meets Dream Theater...the progressions I recorded sound something like that." I've covered all the Modes for Guitar in the key of "E"
I've left the chords really heavy with power chords, so many of the progressions you can apply more than one scale. Including Exotic Scales like the Japanes Pentatonic, Gypsy Minor Scale and Lydian Dominant. Plus I recorded a few progressions with key changes, so you can really learn to master your fretboard skills. So I hope you consider purchasing this "CD" to help push your playing to a whole new level. Download the ShredTRAX PDF FILE..